This First Task Chair features a mesh back and fabric seat. 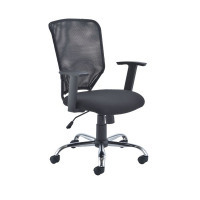 It is supplied with height adjustable arms and a chrome base. The lock-tilt mechanism allows you to easily adjust the seating position to what suits you. Recommended usage time: 8 hours. Max weight tolerance: 18 stone. Seat dimensions: W500 x D480mm. Back dimensions: W480 x H570mm. Seat height: 435 - 530mm. Arm height: 630 - 720mm.